Now the jelly is served as a traditional holiday dish, but if you look at history, it is not always the food in Russia was considered worthy of celebration. In wealthy homes, after the feast was going leftovers, covered with broth, cooked and cleaned in the cold. Such second-rate food given to servants. A new taste and grace gave the dish a French chef, once the fashion for all things French came to our country. True fans of Brawn to add to the dish gelatin is considered bad manners. So now we will talk about exactly how to make jelly without gelatin. The Deposit has a delicious jelly – a well-chosen meat ingredients. There is a perception that without the addition of beef dish may not be frozen. If you have the opportunity to cook the jelly with them, you do not need to embrace if this is not possible, you should not get upset. To jelly frozen, enough pork legs. Only there is one caveat – the legs relative to the other meat should be at least a third. For example, 700 grams of legs with hooves (this is mandatory) should take no more than half the kilograms of other meat. Meat can take absolutely any – veal, beef, chicken. Some do not recognize in jelly poultry. But here it is for everybody. It is important to understand that a large amount of meat will not allow the aspic to set. For better gelation of the meat should be with the skin and veins. Before you prepare the jelly, the meat should be cut, cleaned and osmolite skin if you need it, and then have to soak it for several hours in cold water. You can soak the meat all night. After soaking, the meat is washed, put in a pot or saucepan and filled with water 5 cm above and placed on the fire. After boiling, the fire must reduce will go permanent formation of foam, it should be continuously removed. The process takes about 10 minutes, then stops completely. Then the pan needs to cover and bring the boil to a minimum. Even if the water boils away, nor should it be pour. After the jelly comes to a boil, it should cook on low heat for about 5 hours. After this time the broth is added unpeeled, but thoroughly washed carrots, onions, roots of celery or parsley. Added spice from allspice and peas, definitely Bay leaf. Add salt to taste, about it can be teaspoon of salt. If the water is substantially evaporated, you will have to add it from the kettle, as the fluid will need. Cook jelly then another hour and a half. 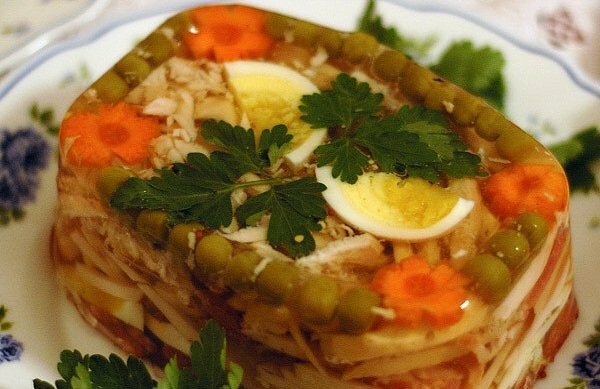 In General, the aspic is cooked at least six hours. When the jelly is cooked, filter the broth through cheesecloth or through a sieve. Unnecessary roots, carrots and onions discarded, meat cut into small pieces with your hands. Grinder is better not to scroll, otherwise there is a risk to leave the bone. To cut meat is added crushed through a garlic press. In the pre-prepared dishes spread meat component of the jelly, then pour it with the broth. Very carefully everything gets mixed up. After it is all glassed trays, dish should give to cool completely. Then put the trays in the refrigerator, preferably on the middle shelf. If the trays are covered with lids, you can stack them on each other. If the caps are not – you can cover the dish cutting Board. Properly cooked the jelly hardens about 4-5 hours. It is better to let it sit in the fridge overnight. Before you serve the dish on the table, the dishes should be immersed for a few seconds in hot water, then the jelly will easily separate from the dish. Heated in this way the dishes turn, substituting for jelly flat dish. Serve the aspic can be horseradish or mustard.